Celebrate Pride month in Scarborough with East Side Pride! The University of Toronto has joined East Side Pride this year. 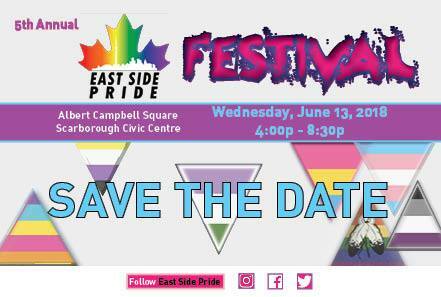 Join us for the 5th annual East Side Pride festival at Albert Campbell Square on Wednesday, June 13 from 4:00 – 8:30 pm. Come out and enjoy an evening of music, free food, games, art stations, community resource tables, and vendors. The festival will include interactive activities and there will be prizes and giveaways. Gather your pals and dare to meet new friends. Come dance, play, shine, and have fun celebrating LGBTQ* diversity in Scarborough. We hope to see you there.